Harold Victor Ashford was born in 1898 to parents Thomas Baker Ashford and Caroline Ashford (nee Payne). By the 1901 census, the family were living at 79 Newhampton Road West. Harold was the youngest child, and was listed together with his brothers Ernest T. (17), Arthur (14), and Charles (13), and his sisters Eveline E. (18) and Ellen (15). Thomas Ashford, originally from Leeds, was a Filesmith (foreman). By the 1911 census, the family had moved to 89 Newhampton Road West. Harold’s mother had been widowed by this point, and the remaining children living at the house were Ellen, Arthur, Charles and Harold. Harold’s medal card states that he was a gunner in the Royal Garrison Artillery, regiment number 189738. No further records are available regarding his war record, but he appears to have survived as (according to Freebmd) a Harold V. Ashford died in Wolverhampton in 1961, aged 64. There is no record of him ever marrying. 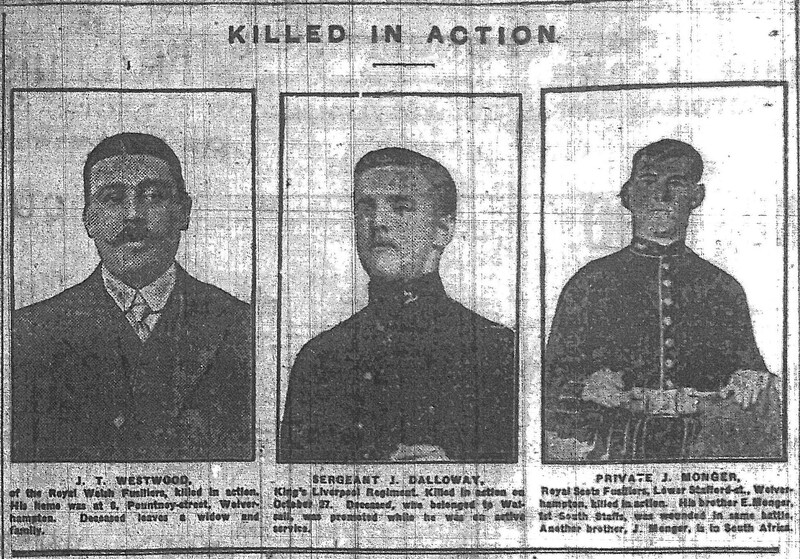 J. T. Westwood of the Royal Welsh Fusiliers, killed in action. His home was at 6, Pountney Street, Wolverhampton. Deceased leaves a widow and family. By a strange coincidence, this man happened to be the great-great-uncle of one of our readers. This enabled us to find out a bit more information about the man behind the photograph. According to Freebmd, the birth of Joseph Thomas Westwood was registered in September 1885, and he married in 1908. Tom, as he was known, was a fishmonger and prior to the outbreak of the Great War had served as a regular in the Royal Welsh Fusiliers. 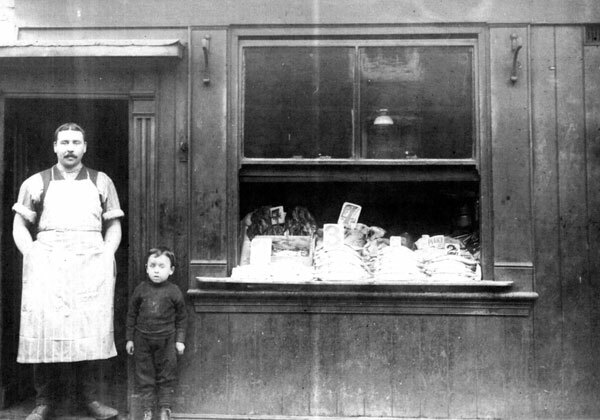 In our photographic collection within the Archives, we hold a photograph of his shop at 6 Pountney Street, which includes him and his son, Samuel, standing outside. Westwood was killed in action on 27 October 1914, and he is commemorated on the Memorial at Ypres. He is also listed on the war memorial in St John’s Church, as well as on the official Wolverhampton Roll of Remembrance. Frederick Stanley was born in Wolverhampton in 1894, his parents were Frederick and Harriet Stanley. In 1901 the family consisted of father, mother, Frederick, and his two brothers, Albert and Howard, and they were living at 233 Gordan (or Goodman) Street, in Normanstow, Stafford. Frederick Senior was a Police Constable. By 1911 the family had grown to include a further two children, these were Gladys Hal (aged 7 years) and Enos Reginald (aged 6 years). The family had returned to Wolverhampton and were living at No 4 Evans Street, Whitmore Reans. By this time the mother of the family, Harriet, had died and the household living at Evans Street included Frederick Senior’s mother Myra Stanley and his mother-in-law Ann Mitchell. At this time Frederick was employed as a Mineral Hewer. Frederick Junior enlisted on 22 November 1912 aged 18 years and 11 months, into the Grenadier Guards, Service No 2604639, Rank Private. He served with his regiment, when fighting at Ypres, he received two bullet wounds on 20 October 1914. One entered the right side of his back and was extracted from the chest, another tore through his right thigh, but the third bullet flew through his tunic sleeve without doing him any injury. He was moved to hospital in London, where doctors operated to remove an abcess, caused by the shrapnel bullet, from his liver. 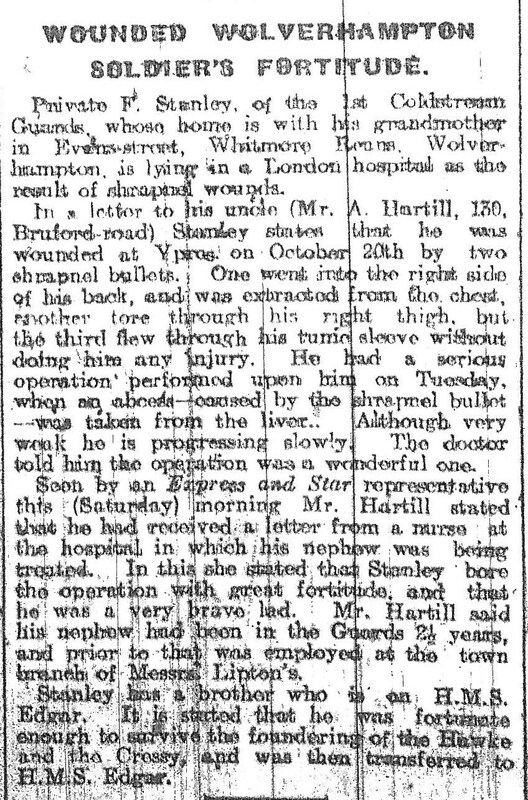 A nurse at the hospital wrote a letter to his uncle, a Mr A. Hartill, which was reported in the Express & Star. The newspaper proudly proclaimed that “she stated that Stanley bore the operation with great fortitude, and that he was a very brave lad.” The article also mentioned Stanley’s brother, who was serving on the HMS Edgar, after having survived the foundering of two ships, the Hawke and the Cressy. It is not clear from the article which of Frederick’s three brothers this is referring to. Alfred was born in Tettenhall on 5 July 1883 to parents Alfred Cooper and Sarah Hannah Speed, and displayed artistic promise at an early age, exhibiting at the Royal Academy for the first time aged just 18. He attended Bilston School of Art in Mount Pleasant, and graduated from the Royal College of Art in 1911. Cooper specialised in portraits, figure subjects and landscapes, exhibiting at the Manchester City Art Gallery, Walker Art Gallery, the Paris Salon and elsewhere. While still a student, Cooper entered a competition for which John Singer Sargent was one of the judges. Impressed by the young Cooper’s work, Sargent invited Cooper to work with him at his studio in Tite Street, Chelsea which had belonged to James McNeill Whistler. Cooper was to spend about a year with Sargent assisting the Master with backgrounds and details for his paintings. Cooper was elected ARBA 1921 and a full member two years later. Cooper joined the Artists Rifles at the outbreak of war, where he befriended Dr Barnes Wallis, who later found fame for creating the “Dam Buster” bouncing bomb. He was promoted to Second Lieutenant in 1915. It was also during his training at Romford that he met his future wife, Irene Florence Clements, when her parents entertained officers at their home. Though Cooper survived the War, his sight was impaired during a chlorine gas attack, and after the Armistice he was appointed an Official War Artist to the RAF. He married his wife in 1920, and they had a son, Peter, five years later. Among Cooper’s high profile commissions were Sir Winston Churchill, The Queen, and her father King George VI; during the Blitz, the King’s medals were delivered to Cooper’s studio so that he could paint them, and he was terrified that they would be destroyed by a bomb. Cooper died in Chelsea, London, on 11 May 1974. We have in our collections in the Archives a book entitled Wolverhampton Volunteer Rifle Corps at Burwarton Camp 1915, which contains photographs and a potted history of the Corps. The Wolverhampton Rifle Corps was inaugurated on 7 September 1914. This was part of the drive to ensure that, in the rush of men joining the Army and Territorial forces, there was still a military presence to assist with defence of the home soil. Early on, the “Rifles” held various instructional musters in the Territorial Drill Hall and the National Reserve Headquarters. They were also active on Sunday afternoons, doing field exercises, marches and trench construction. Firing practice also took place at Patshull Rifle Club. Initially, men who joined the Corps were those who were ineligible for military service at that time, but who were keen to contribute to the war effort. From 1915 onwards, the Corps decided to become an officers’ training corps and to act as a mobile column, and many men who later joined the Army started off with the Rifle Corps. Part of the Association of Volunteer Training Corps, the Wolverhampton Corps was one of the first in England to “appear in public fully uniformed, armed with Service rifles, and equipped.” This is fairly remarkable, given that the costs of the equipment were being met by the individual members of the Corps. Burwarton Camp was a training event organised in August 1915. The group assembled at Bridgnorth in Shropshire (apparently attracting “great interest” from “the people attending the weekly market”), before parading nine miles to the camp at Burwarton. Once there, the platoons were able to take refreshments, before digging trenches round all the tents. Whilst at the camp, the Corps were involved in marching, manoeuvres, bayonet practice and other training. Both the Mayor-elect of Wolverhampton and the MP for Wolverhampton West took time out to visit the troops during their stay. For those interested in the Corps, there are many interesting photographs in the book. A more detailed history of Volunteer forces across the Black Country has been provided by the Black Country Bugle. We featured the school log book from the Cottage Homes in Amos Lane back in November 2012. We also hold minute books of the Cottage Homes Committee for the period covering the Great War, which further illustrate how it affected daily life. The first mention of the War comes in the meeting on 3 September 1914, when it was (understandably) agreed to allow Lieutenant Willner, the Drill Instructor, leave of absence until further notice as he is “away on active service”. By 26 November, this situation was clearly becoming untenable, as Mr T. P. O’Hara (Mental Attendant at the Workhouse) was appointed Temporary Drill Instructor during Willner’s absense, at a salary of £20 per annum. Other than these matters, there is very little reference to the War, as the Committee mainly deals with supplies to the Homes, appointment of staff, and reboarding of children. It appears that the sinking of this ship was not down to enemy action, but in fact due to an internal explosion while the ship was at Scapa Flow. Although Mr Knight escaped the incident unscathed, it is estimated that around 804 men were killed, and it is described on Wikipedia as “the most catastrophic accidental explosion in the history of the UK”. This indicates how events abroad did still overshadow the day-to-day routine back at home. Wandering down Church Road with my eight-year-old son during the Easter holidays, we decided to take a look at the war memorial opposite St Philip’s Church in Penn. Further details of this and other war memorials in the area are on Doug Lewis’s excellent website. I found the war memorial a useful trigger to discuss the issue, given that most of my son’s knowledge of the First World War up to now has come from the Horrible Histories books. of 82 Church Rd Bradmore, Wolverhampton.Native of the Isle of Man. A search of ManxBMD confirms his origins, with the birth of an Edward Charles Christian being registered in the District of Patrick in 1895. The son of Edward Henry Christian and Charlotte Henrietta Hely, he appears to have been linked with members of the peerage. The circumstances surrounding the family’s move from the Isle of Man are unclear, but certainly by the 1911 census they are listed in Wolverhampton. 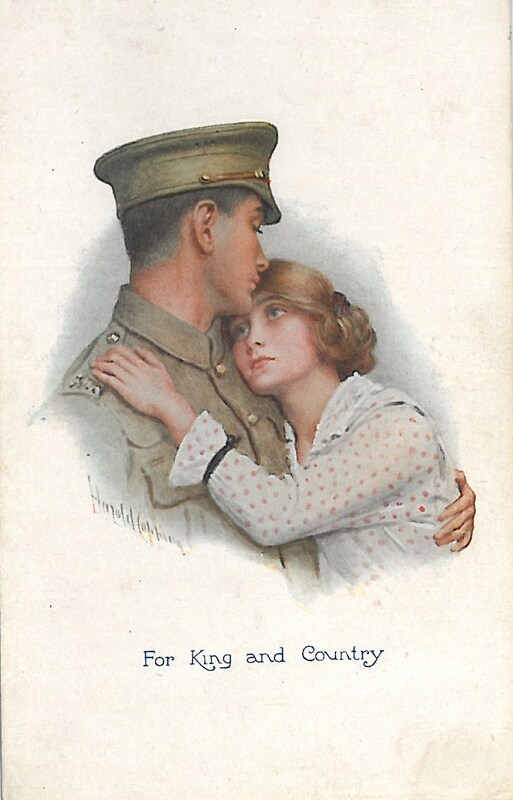 In the case of Annie Lloyd or Loydd we do not even have the surname of her soldier correspondent. Signing himself as “Horace”, he wrote to her at Ash View, The Scotlands, Cannock Road, at least twice during the First World War. In his main letter, Horace writes of life at the Front and in the trenches. He speaks of “two day heavy marching”, as he expects them to move from the East Coast to France. 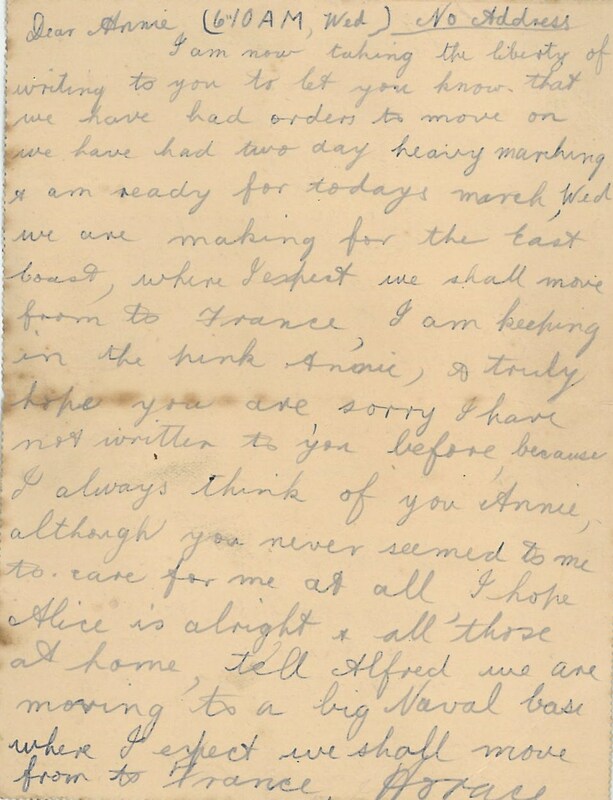 He apologises for not having written before, “because I always think of you Annie,” but this is tinged with sadness as “you never seemed to me to care for me at all.” Understandably because of censorship, there is little further detail in the letter. We do not have any further information about this couple, as the collection was transferred to us from Walsall Archives service, so we do not appear to have any depositor details. 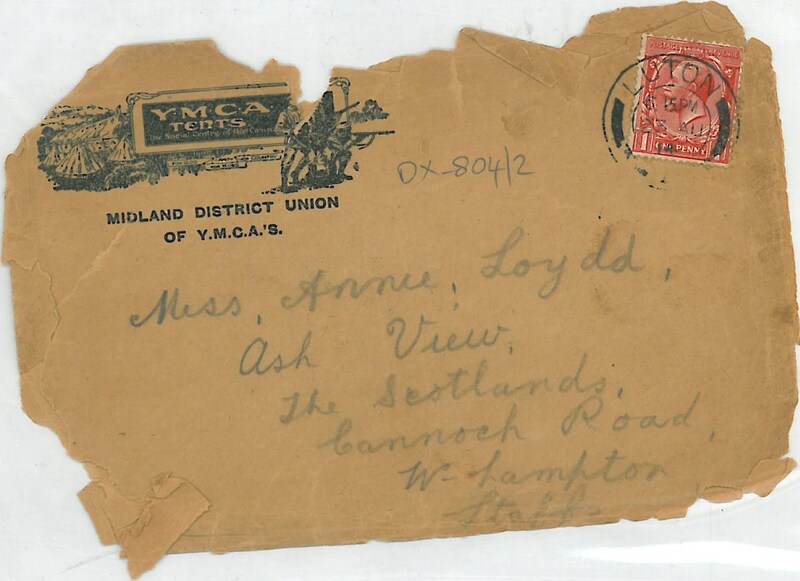 The postmark on the envelope is 1914, so it may be that Horace did not survive the War. Either way, the only possible marriage we have been able to find for Annie is that of an Annie M. Lloyd to a Michael Doherty, registered in December 1922. If this is the same lady as in the letters, it appears that this story did not unfortunately have a happy ending. A quick search through Freebmd reveals the only likely candidate in terms of age as a Joseph Langley Downing, whose birth was registered in Wolverhampton in March 1892. This enables us to find his baptism at Wednesfield St Thomas’ Church on 10 January 1892. His parents are listed as Joseph and Maria Jane Downing, the former being a farmer, of Lichfield Road. On the 1901 census, the family are listed at 104 Lichfield Road, Wednesfield. Joseph L. Downing, aged 9, is together with his brothers George and Ernest, and his sister Mary. According to Downing’s medal card, he left for France with the 1st Battalion of the South Staffordshire Regiment on 4 October 1914. He was discharged from the Army due to wounds or sickness on 7 April 1917, and became eligible for a Silver War Badge (SWB). Silver War Badges were authorised by King George V in September 1916 to honour all military personnel who had served at during the War, and who had been discharged because of wounds or illness. As well as honouring these individuals, the SWB also served as a symbol that the wearer had served his country and was not simply shirking their duty. Wearers of the SWB should not, therefore, have received white feathers, for example. Downing’s death was registered in Wolverhampton in June 1949. He appears to have never married, as no likely records were found.